Michael May: SpringCon This Weekend! One last reminder about SpringCon this weekend at the Minnesota State Fairgrounds. I've got a couple of posts scheduled to go up over the next couple of days, but I'll really be spending all my time at the show. Got some new Cownt stickers to pass out with art by the awesome Dave Bryant. 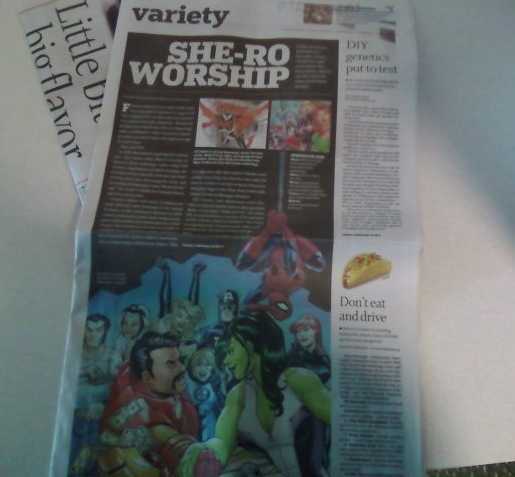 SpringCon got a nice write-up in the Star Tribune today (thanks to Jess Hickman for sending me that picture), so hopefully there'll be a great turnout. Weather's supposed to be in the 70s (first time in a while for the Twin Cities), so I imagine that a lot of folks will want to be outside. We're supposed to get some rain on Sunday though, so if it's not storming or anything that could drive attendance up. Happy Maltese Thin Man Day! The Awesome List: You! The one who is moving now! Art Show: Play it Again, Sallah. Art Show: Stay Alive on the Terror-Planet! Quote of the Month: Set Phasers to Stunning!